Steering Committee members: The Steering Committee acts as leadership for the organization throughout the season (June 2018 – June 2019). No experience required, only good leadership and organizational skills needed. Attend steering committee meetings and spend a few hours of time for committee tasks each week, based on your availability. Committee members: The committees are broken into focused roles to help organize all events. Attend one meeting each month and a few hours of time for committee tasks each week, based on your availability. 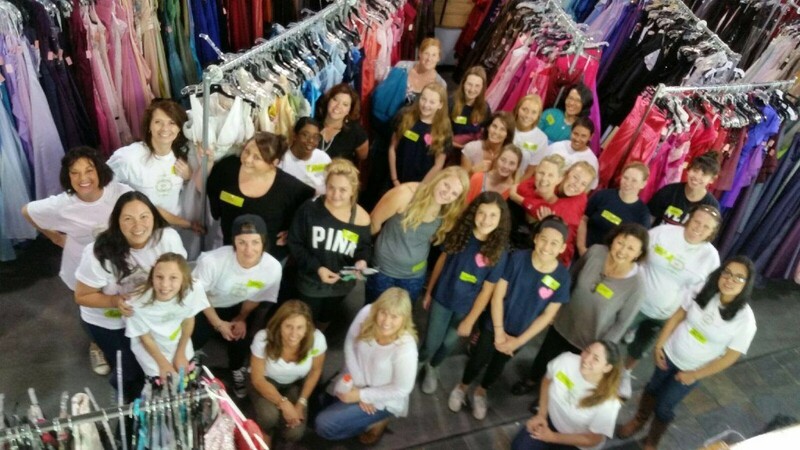 Season volunteers: Shifts will be available during this event season (February 2019 – June 2019) including the prom and dress giveaway (March – April 2019) boutique set up, dress sorts (February – March 2019), and fundraising events. These opportunities are posted on our website and emailed to our contacts. Make sure you are on our email list. Teen Outreach (Member positions available) Build awareness in high schools. Make contact with school & community administrators. Encourage high school teens to attend the giveaway event. Find similar community groups and non-profits helping teens in need. Manage appointment software. Volunteer Outreach (Member positions available) Build awareness in community. Recruit volunteers and volunteer groups for events. Manage volunteers during events – using scheduling software. Provide volunteer hospitality – seek refreshment and snack donations. Media & Promotions (Member positions available) Help manage media efforts. Publicize dress drives. Website updates & social media, promote fundraising and giveaway events. Consistently represent organization and brand. Dress & Accessories Collection (Member positions available) Manage dress and accessory drives and secure public drop-off locations. Work with local and national retailers to secure product donations. Manage & sort dress inventory. Event Site & Staging (Member positions available) Lead efforts surrounding event space layout, decorations, & hospitality. Provide a safe space for teens and volunteers. Set up the dress store for dress sales throughout the year. For more information or to join a committee, please email us at sandiego@princessproject.org! Here is a video that will make your heart sparkle.